I knew it will cost me hundreds of dollars to buy a set of hall table and mirror. Gosh, they're like $300 and up. I'm glad I made a right decision and purchased them separately ( Walmart: $79 for the 3-tier table and Ross: $24 for the mirror). It has been over 3 years since we have this hall table and mirror. 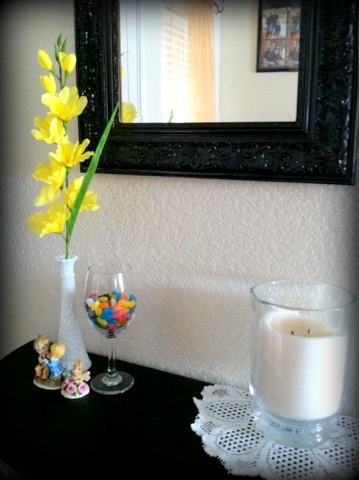 Our simple easter/spring hall table decors. nice...the yellow flower is a nice addition. Yan din problema ko sis, di ako makakita ng b;ack table that would match up our mirror on th wall hehehe.. Beautiful;~! Where did you purchase your mirror? I like the black old-style frame. It fits my choice in these New York new homes. For what it's worth, that is perfectly reminiscent of the new homes in gaithersburg md which I just viewed in last week. This is incredible! Great. You got it in cheapest rates as logo pearl offers cheap web design service.